For the 1993 film, see The Beverly Hillbillies (film). The Beverly Hillbillies is an American sitcom television series originally broadcast on CBS from 1962 to 1971. The show had an ensemble cast featuring Buddy Ebsen, Irene Ryan, Donna Douglas, and Max Baer Jr. as the Clampetts, a poor backwoods family from the Ozarks region who move to posh Beverly Hills, California, after striking oil on their land. The show was produced by Filmways and was created by writer Paul Henning. It was followed by two other Henning-inspired "country cousin" series on CBS: Petticoat Junction, and its spin-off Green Acres, which reversed the rags-to-riches, country-to-city model of The Beverly Hillbillies. The Beverly Hillbillies episode 18: "Jed Saves The Drysdales' Marriage"
The Beverly Hillbillies ranked among the top 20 most-watched programs on television for eight of its nine seasons, twice ranking as the number one series of the year, with a number of episodes that remain among the most-watched television episodes in history. It accumulated seven Emmy nominations during its run. The series remains in syndicated reruns, and its ongoing popularity spawned a 1993 film remake by 20th Century Fox. The series starts as Jed Clampett, an impoverished and widowed mountaineer, is living alongside an oil-rich swamp with his daughter and mother-in-law. A surveyor for the OK Oil Company realizes the size of the oil field, and the company pays him a fortune for the right to drill on his land. Patriarch Jed's cousin Pearl Bodine prods him to move to California after being told his modest property could yield $25 million, and pressures him into taking her son Jethro along. The family moves into a mansion in wealthy Beverly Hills, California, next door to Jed's banker, Milburn Drysdale. The Clampetts bring a moral, unsophisticated, and minimalistic lifestyle to the swanky, sometimes self-obsessed and superficial community. Double entendres and cultural misconceptions are the core of the sitcom's humor. Plots often involve the outlandish efforts Drysdale makes to keep the Clampetts' money in his bank and his wife's efforts to rid the neighborhood of those hillbillies. The family's periodic attempts to return to the mountains are often prompted by Granny's perceiving a slight from one of the "city folk". Buddy Ebsen as J. D. "Jed" Clampett, the widowed patriarch and head of the household. Irene Ryan as Daisy May ("Granny") Moses, Jed's mother-in-law and Elly May's maternal Grandmother. Max Baer Jr. as Jethro Bodine, the brawny, half-witted son of Jed's cousin Pearl. Although he has little formal education, Jed Clampett (Buddy Ebsen) has a good deal of common sense. He is the son of Luke Clampett and his wife, and has a sister called Myrtle. Jed is a good-natured man and the head of the family. The huge oil pool in the swamp he owned was the beginning of his rags-to-riches journey to Beverly Hills. He is usually the straight man to Granny and Jethro's antics. His catchphrase is, "Welllllll, doggies!" Jed was one of the three characters to appear in all 274 episodes of the series. Daisy May Moses (Irene Ryan), called "Granny" by all, is Jed's mother-in-law. In the first season she implies she is 72 years old when she says she has not slept in so late in 72 years. Paul Henning, the show's creator/producer, quickly discarded the idea of making Granny Jed's mother, which would have changed the show's dynamics, making Granny the matriarch and Jed subordinate to her. Granny can be aggressive, but is often overruled by Jed. She is a Confederate to the core, defending President Jefferson Davis and the Stars and Bars, though she erroneously believes it was the North that fought to preserve slavery. Short-fused and easily angered, Granny fancies herself a Baptist ("dunked, not sprinkled") Christian with forgiveness in her heart. A self-styled "M.D." — "mountain doctor" — she claims to be better than expensive trained physicians. In lieu of conventional anesthesia, Granny uses her "white lightning" brew before commencing painful treatments such as leech bleeding and yanking teeth with pliers. She loves and defends the simple life. Granny's full name, Daisy Moses, is allegedly an homage to the popular and dearly loved folk artist Anna Mary Robertson, known to the world as Grandma Moses, who died in 1961, a year before The Beverly Hillbillies made its television debut. Granny is frequently referred to as "Granny Clampett" in a number of episodes, but technically she is a Moses. Granny appears in all 274 episodes. Elly May (Donna Douglas in all 274 episodes), the only child of Jed and Rose Ellen Clampett, is a mountain beauty with the body of a pinup girl and the soul of a tomboy. She can throw a fastball as well as "rassle" most men to a fall, and she can be as tender with her friends, animals, and family as she is tough with anyone she rassles. She says once that animals can be better companions than people, but as she grows older, she allows that, "fellas kin be more fun than critters." In addition to the family dog, Duke (an old Bloodhound), a number of pets live on the Clampett estate thanks to animal-lover Elly. In the 1981 TV movie, Elly May is the head of a zoo. Elly is a terrible cook. Family members cringe whenever, for plot reasons, Elly takes over the kitchen. 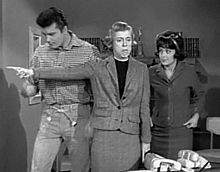 Jethro (Max Baer Jr. in 272 episodes) is the son of Jed's cousin, Pearl Bodine (though he addresses Jed as "Uncle Jed"). He drives the Clampett family to their new home in California and stays on with them to further his education. The others boast of Jethro's "sixth-grade education", but he is ignorant about nearly every aspect of modern California life. In one episode, he decides to go to college. He enrolls late in the semester at a local secretarial school and "earns" his diploma by the end of the day because he is so disruptive. This was an ironic in-joke – in real life, Max Baer Jr. has a bachelor's degree in business administration, minoring in philosophy, from Santa Clara University. Many story lines involve Jethro's endless career search, which include such diverse vocations as a millwright, a brain surgeon, street car conductor, "double-naught" spy, telephone lineman, soda jerk, chauffeur, USAF general, short-order cook, sculptor, restaurant owner (with Granny's cooking), psychiatrist, and once as a bookkeeper for Milburn Drysdale's bank; a Hollywood agent for "cousin" Bessie and "Cousin Roy" (see below); Hollywood producer (a studio flunky remarks Jethro has the "right qualifications" for being a producer: a sixth-grade education and an uncle who owns the studio; this in-joke gag as a movie producer was replayed in the 1981 movie). More often than not, his overall goal in these endeavors is to meet pretty girls. He only manages to gain (but is oblivious to) the affections of the plain Miss Jane Hathaway. Of all the Clampett clan, he is the most eager to embrace city life. A running gag is that Jethro is known as the "six-foot stomach" for his huge appetite: in one episode, he eats a jetliner's entire supply of steaks; in another, Jethro tries to set himself up as a Hollywood agent for cousin "Bessie" the chimpanzee – with a fee of 10,000 bananas for Bessie and 1,000 for him. Jethro does not appear in the third- or second-to-last episodes, but Baer remains billed in the title credits. With the January 2015 death of Donna Douglas, Baer is the only surviving main cast member. Milburn (Raymond Bailey in 247 episodes) is the Clampetts' banker, confidant and next-door neighbor. He is obsessed with money, and to keep the Clampetts' $96,000,000 (in 1969; equivalent to $655,883,848 in 2018) in his Commerce Bank, Mr. Drysdale will do everything he can to cater to their every wish. He often forces others, especially his long-suffering secretary, to help fulfill their outlandish requests. Nancy Kulp (center) as Jane Hathaway, with Max Baer Jr. and Sharon Tate (in a dark wig). Jane Hathaway (Nancy Kulp in 246 episodes), whom the Clampetts address as Miss Jane, is Drysdale's loyal and efficient secretary. Though she reluctantly carries out his wishes, she is genuinely fond of the family and tries to shield them from her boss's greed. Miss Hathaway frequently has to "rescue" Drysdale from his schemes, receiving little or no thanks for her efforts. The Clampetts consider her family; even Granny, the one most dead-set against living in California, likes her very much. Jane harbors something of a crush on Jethro for most of the series' run. In 1999, TV Guide ranked Jane Hathaway number 38 on its list titled "50 Greatest TV Characters of All Time". Milburn Drysdale's wife Margaret (Harriet E. MacGibbon; 55 episodes in 1962–69) is a blue-blooded Bostonian who traces her family back to the Mayflower and has obvious disdain for the "peasant" and "dreadful" hillbillies, especially Granny, with whom she occasionally has "scraps". Her son, Milburn's stepson, Sonny (Louis Nye) is introduced as a 35-year-old collegian who does not believe in working up a sweat and is a mama's boy. He courts Elly May until she literally tosses him. Sonny only appears in four episodes, three in 1962 and a final appearance in 1966. Pearl Bodine (Bea Benaderet; 22 episodes in season 1) is Jed's widowed cousin. Pearl is a generally well-meaning mother to Jethro. She was also a popular character, often used as a foil for Granny, and became a regular part-way through the first season (the end credits were even refilmed to include Pearl with the other family members). The character disappeared after the first year because Benaderet had become the star of another Paul Henning series, Petticoat Junction. She is the daughter of Amos Clampett, Jed's uncle. Like Elly May, Pearl's name came from that of a character (Pearl Lester) in the popular rural-life novel, play, and film Tobacco Road. In the episodes "The Clampetts Get Psychoanalyzed" and "The Psychiatrist Gets Clampetted", Herbert Rudley plays the psychiatrist Dr. Eugene Twombley, with whom Pearl is enamored; Benaderet's real-life husband was named Eugene Twombly. In season six, she makes a cameo appearance in the episode "Greetings from the President". Jethrine Bodine (played by Baer, but voiced by Linda Kaye Henning; 11 episodes in season 1): Jethrine is Pearl's king-sized daughter and Jethro's twin. Jethrine appears in the first season; she moves with her mother to the Clampett mansion later that season, but occasionally is not seen in episodes during her stay in California. Jethrine is upset to leave the hills as it means separation from her "sweetie", traveling salesman Jasper "Jazzbo" Depew (played by Phil Gordon in many episodes in the first series). Late in the season, it was explained in an episode that Jethrine had returned home to marry Depew. Jethro and Jethrine rarely appeared in the same scene in any of the episodes, and then they were never on-camera at the same time, except for the rare back-of-the-head shot using a double. Jethrine also appears in the 1993 movie version. Honest John Shafer (Phil Silvers; 6 episodes 1969-1970) is a sleazy confidence man who targets the Clampetts with various outrageous schemes such as selling Washington, DC to Jed. Although Honest John always succeeds in initially bilking the Clampetts out of millions his conscience always gets the better of him once he realizes that the Clampetts actually hold him in the highest esteem and treat him almost like family. Dash Riprock (Larry Pennell; 10 episodes in seasons 3–7) is a handsome Hollywood actor employed by Jed's movie studio. He and Elly May meet while she is working as an extra at the studio. The two have an on-and-off relationship. Riprock was a send-up of the blatantly fake screen names employed by a number of movie actors of the period. Riprock's real name (before being changed by Hollywood moguls) was "Homer Noodleman", and he was from Peoria, Illinois. Lowell Redlings Farquhar (Charles Ruggles; three episodes in seasons 4 and 5) is the elderly father of Mrs. Drysdale. Granny considers him a potential beau. John Brewster (Frank Wilcox; 14 episodes, 1962–1966), is the president and CEO of the OK Oil Company, headquartered in Tulsa, who purchases the oil rights to the gusher on the Clampett home. The Clampetts are quite fond of him, and his wife occasionally visits them in California. Sam Drucker (Frank Cady; 10 episodes in 1968–70) owns the general store in Hooterville. Granny is constantly under the impression Sam wants to marry her, but Sam has no such intention. Cady also starred as Sam Drucker in Petticoat Junction and Green Acres. Cady reprised the role of Sam Drucker for the 1990 Green Acres reunion movie Return to Green Acres. Helen Thompson (Danielle Mardi; 17 episodes in 1969–71) is a beautiful British secretary at the Commerce Bank. Helen takes over Miss Hathaway's job as Mr. Drysdale's secretary after Miss Hathaway resigns. She is one of the ringleaders of the protest group the secretaries of the Commerce Bank create: GRUN (Girls Resist Unfair Neglect). She, along with many other secretaries, as well as Elly and Granny, live with Miss Hathaway for a short time in her apartment. Shorty Kellums (Shug Fisher; 17 episodes in seasons 8 and 9) is Jed's longtime buddy from back home, with whom Jed reunites in 1969 when the Clampetts go back home for an extended period. Shorty is a wiry little man who is crazy about voluptuous girls half his age. Shorty later moves into the Clampett mansion in Beverly Hills for a while. Elverna Bradshaw (Elvia Allman; 13 episodes, 1963–70) is Granny's longtime rival back in the hills, a gossip second to none. Referenced as early as episode 3, she makes a brief appearance in a 1963 episode when the Clampetts go back home to bring Pearl to California, but is not seen again until 1969, when the Clampetts return for an extended visit. However, both Granny and Jed refer to the character in several episodes throughout the series' run. 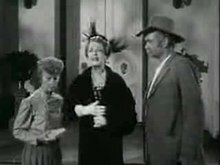 Elverna and Granny rekindle their feud in a match to see who will be the first to marry, Elverna's daughter or Elly May. For reasons not really explained, Elverna also moves into the Clampett Beverly Hills mansion during the same period Shorty does; both of them, however, are not present for the final 1970–71 season. Matthew and Mark Templeton (brothers played by actor Roger Torrey, who had auditioned for the part of Jethro; three episodes in season 8 as Matthew; 9 in season 9 as Mark) Matthew is the preacher Granny tags as a prospective husband for Elly. Unfortunately, Granny learns Matthew is married. Just a year later back in California, Elly meets Matthew's brother, Mark Templeton, who is a marine biologist and a frogman, whom Granny believes is actually part frog. The Mark Templeton storyline played out for nine episodes and was abruptly dropped, although advance publicity for the show indicated Elly May and Mark would marry during the season; however, the show was canceled at the end of that season as part of the CBS Rural Purge. The show's theme song, "The Ballad of Jed Clampett", was written by producer and writer Paul Henning and originally performed by bluegrass artists Flatt and Scruggs. The song is sung by Jerry Scoggins (backed by Flatt and Scruggs) over the opening and end credits of each episode. Flatt and Scruggs subsequently cut their own version of the theme (with Flatt singing) for Columbia Records; released as a single, it reached number 44 on Billboard Hot 100 pop music chart and number one on the Billboard Hot Country chart (the lone country chart-topper for the duo). The six main cast members participated on a 1963 Columbia soundtrack album, which featured original song numbers in character. Additionally, Ebsen, Ryan, and Douglas each made a few solo recordings following the show's success, including Ryan's 1966 novelty single, "Granny's Miniskirt". The series generally features no country music beyond the bluegrass banjo theme song, although country star Roy Clark and the team of Flatt and Scruggs occasionally play on the program. Pop singer Pat Boone appears in one episode as himself, under the premise that he hails from the same area of the country as the Clampetts, although Boone is a native of Jacksonville, Florida. The 1989 film UHF featured a "Weird Al" Yankovic parody music video, "Money for Nothing/Beverly Hillbillies*", combining "The Ballad of Jed Clampett" and English rock band Dire Straits' 1985 hit song "Money for Nothing". Season seven (1968–69) was packed with strategically placed, multi-episode crossover stories in which the fictional worlds of all three Paul Henning series overlap. The Clampett family makes several trips to Hooterville (which was first mentioned in season 1 episode 6 when Jazzbo Depew attempts to sweet talk Jethrine Bodine), Sam Drucker visits Beverly Hills, and Granny (Irene Ryan) does two guest appearances on Petticoat Junction. In season eight (1969–70), the Clampett family visits Hooterville one last time for a two-part episode. "Granny Goes to Hooterville" (season 7: episode 6) - Granny leaves for Hooterville upon hearing distant cousin Betty Jo Bradley (Linda Henning) just had a baby. The only Petticoat Junction cast members in this episode are Sam Drucker (Frank Cady) and Uncle Joe (Edgar Buchanan) seen talking to Granny on the phone. (The story continues on the Petticoat Junction episode "Granny, the Baby Expert".) "The Italian Cook" (7:7) wraps up the three-episode Hooterville story arc featuring Betty Jo, her husband Steve Elliott (Mike Minor), and Sam Drucker. "The Thanksgiving Story" (7:10) - The Clampetts visit Hooterville and mingle with the Petticoat Junction cast. This includes a silent, split-second insert of Eddie Albert and Eva Gabor of Green Acres. Jethro pretends to be a Hollywood producer and tries to romance Billie Jo (Meredith MacRae) and Bobbie Jo (Lori Saunders) Bradley. This arc continues in the next episode, "The Courtship of Homer Noodleman" (7:11), with the Clampetts leaving for home following Eb Dawson's (from Green Acres) falling for Elly May. "The Week Before Christmas" (7:13) - The crossover aspect is limited to two scenes in Sam Drucker's general store with the Bradley sisters and Drucker talking to Granny over the phone. The same broadcast week, Petticoat Junction aired "A Cake from Granny" with shots of Granny and Jane Hathaway (Nancy Kulp) in Beverly Hills baking a cake. "Christmas in Hooterville" (7:14) reunites the Clampett family with the Petticoat Junction cast. The follow-up episode, "Drysdale and Friend" (7:15), has appearances by Sam Drucker and Green Acres regular Fred Ziffel (Hank Patterson). "Sam Drucker's Visit" (7:23) - The final season seven crossover with Sam Drucker dropping in on the Clampetts in Beverly Hills. Drucker and Betty Jo share one scene set in his Hooterville General Store. In season eight, "Buzz Bodine, Boy General" (8:15) and "The Clampett-Hewes Empire" (8:16) comprise the last two-part crossover of the series. The Clampetts return to Petticoat Junction in a story featuring Steve Elliott, Betty Jo, Sam Drucker, and a rare Hooterville visit by Miss Hathaway and Mr. Drysdale (Raymond Bailey). During season nine, after the cancellation of Petticoat Junction, Lori Saunders appeared in three episodes playing a new recurring character, Elizabeth Gordon. Regardless of the poor reviews, the show shot to the top of the Nielsen ratings shortly after its premiere and stayed there for several seasons. During its first two seasons, it was the number one program in the U.S. During its second season, it earned some of the highest ratings ever recorded for a half-hour sitcom. The season-two episode "The Giant Jackrabbit" also became the most watched telecast up to the time of its airing, and remains the most-watched half-hour episode of a sitcom, as well. The series enjoyed excellent ratings throughout its run, although it had fallen out of the top 20 most-watched shows during its final season. In 1997, the season 3 episode "Hedda Hopper's Hollywood" was ranked Number 62 on "TV Guide's 100 Greatest Episodes of All Time". The Clampetts' truck is a 1921 Oldsmobile Model 37. This one, which was modified by George Barris, is on display at Planet Hollywood in Disney Springs. The original truck is at the College of the Ozarks. Season nine, during the 1970–71 TV season placed 33rd out of 96 shows. Despite the respectable ratings, the show was canceled in the spring of 1971 after 274 episodes. The CBS network, prompted by pressure from advertisers seeking a more sophisticated urban audience, decided to refocus its schedule on several "hip" new urban-themed shows and, to make room for them, the two remaining series of CBS's rural-themed comedies were simultaneously cancelled. This action came to be known as "the Rural Purge". Pat Buttram, who played Mr. Haney on Green Acres, famously remarked, "It was the year CBS cancelled everything with a tree - including Lassie." In 1981, Return of the Beverly Hillbillies television movie, written and produced by series creator Henning, was aired on the CBS network. Irene Ryan had died in 1973, and Raymond Bailey had died in 1980. The script acknowledged Granny's passing, but featured Imogene Coca as Granny's mother. Max Baer decided against reprising the role that both started and stymied his career, so the character of Jethro Bodine was given to another actor, Ray Young. The film's plot had Jed back in his old homestead in Bug Tussle, having divided his massive fortune among Elly May and Jethro, both of whom stayed on the West Coast. Jane Hathaway had become a Department of Energy agent and was seeking Granny's "White Lightnin'" recipe to combat the energy crisis. Since Granny had gone on to "her re-ward", it was up to Granny's centenarian "Maw" (Imogene Coca) to divulge the secret brew's ingredients. Subplots included Jethro playing an egocentric, starlet-starved Hollywood producer, Jane and her boss (Werner Klemperer) having a romance, and Elly May owning a large petting zoo. The four main characters finally got together by the end of the story. Having been filmed a mere decade after the final episode of the original series, viewer consensus was that the series' original spirit was lost to the film on many fronts, chief of which being the deaths of Ryan and Bailey and Baer's absence, which left only three of the six original cast members available to reprise their respective roles. Further subtracting from the familiarity was the fact that the legendary Clampett mansion (the Sumner Spaulding-designed mansion 'Chartwell') - was unavailable for a location shoot as the owners' lease was too expensive. Henning himself admitted sheer embarrassment when the finished product aired, blaming his inability to rewrite the script due to the 1981 Writers Guild strike. In 1993, Ebsen, Douglas, and Baer reunited onscreen for the only time in the CBS-TV retrospective television special, The Legend of the Beverly Hillbillies, which ranked as the fourth-most watched television program of the week—a major surprise given the mediocre rating for the 1981 TV movie. It was a rare tribute from the "Tiffany network", which owed much of its success in the 1960s to the series, but has often seemed embarrassed by it in hindsight, often downplaying the show in retrospective television specials on the network's history and rarely inviting cast members to participate in such all-star broadcasts. The Legend of The Beverly Hillbillies special ignored several plot twists of the TV movie, notably Jethro was now not a film director, but a leading Los Angeles physician. Critter-loving Elly May was still in California with her animals, but Jed was back home in the Hills, having lost his fortune, stolen by the now-imprisoned banker Drysdale. Nancy Kulp had died in 1991 and was little referred to beyond the multitude of film clips that dotted the special. The special was released on VHS tape by CBS/Fox Video in 1995 and as a bonus feature on the Official Third Season DVD Set in 2009. The Beverly Hillbillies is still televised daily around the world in syndication. In the United States, the show is broadcast currently on MeTV, and was previously on Nick at Nite, The Hallmark Channel, and WGN America. A limited number of episodes from the earlier portions of the series run have turned up in the public domain and as such are seen occasionally on many smaller networks such as Retro TV and MyFamily TV. MeTV Network airs The Beverly Hillbillies Monday-Saturday at 7 A.M. The show is distributed by CBS Television Distribution, the syndication arm of CBS Television Studios and the CBS network. It was previously distributed by CBS Films, Viacom Enterprises, Paramount Domestic Television, and CBS Paramount Domestic Television (all through corporate changes involving TV distribution rights to the early CBS library). The repeats of the show that debuted on CBS Daytime on September 5–9, 1966, as "Mornin' Beverly Hillbillies" through September 10, 1971 and on September 13–17, 1971 as "The Beverly Hillbillies" lasted up to winter 1971–72. It aired at 11:00–11:30 am Eastern/10:00-10:30 am Central through September 3, 1971, then moved to 10:30–11:00 am Eastern/9:30–10:00 am Central for the last season on CBS Daytime. Fifty-five episodes of the series are in the public domain (all 36 season-one episodes and 19 season-two episodes), because Orion Television, successor to Filmways, neglected to renew their copyrights. As a result, these episodes have been released on home video and DVD on many low-budget labels and shown on low-power television stations and low-budget networks in 16-mm prints. In many video prints of the public domain episodes, the original theme music has been replaced by generic music due to copyright issues. Before his death, Paul Henning, whose estate now holds the original film elements to the public domain episodes, authorized MPI Home Video to release the best of the first two seasons on DVD, the first "ultimate collection" of which was released in the fall of 2005. These collections include the original, uncut versions of the first season's episodes, complete with their original theme music and opening sponsor plugs. 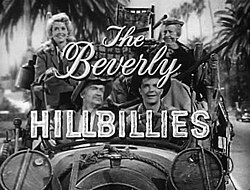 Volume 1 has, among its bonus features, the alternate, unaired version of the pilot film, The Hillbillies Of Beverly Hills (the version of the episode that sold the series to CBS), and the "cast commercials" (cast members pitching the products of the show's sponsors) originally shown at the end of each episode. The alternate version is also the version seen on Amazon Prime Video. With the exception of the public domain episodes, the copyrights to the series were renewed by Orion Television. However, any new compilation of Hillbillies material will be copyrighted by either MPI Media Group or CBS, depending on the content of the material used. For many years, 20th Century Fox, through a joint venture with CBS called CBS/Fox Video, released select episodes of Hillbillies on videocassette. After Viacom merged with CBS, Paramount Home Entertainment (the video division of Paramount Pictures, which was acquired by Viacom in 1994) took over the video rights. In 2006, Paramount announced plans to release the copyrighted episodes in boxed sets through CBS DVD later that year. The show's second season (consisting of the public domain episodes from that season) was released on DVD in Region 1 on October 7, 2008 as "...The Official Second Season". The third season was released on February 17, 2009. Both seasons are available to be purchased together from major online retailers. On October 1, 2013, season four was released on DVD as a Walmart exclusive. It was released as a full retail release on April 15, 2014. On April 26, 2016, CBS/Paramount released the complete first season on DVD. The fifth season was released on October 2, 2018. A three-act stage play based on the pilot was written by David Rogers in 1968. The Deadly Hillbillies, an interactive murder mystery, was written by John R. Logue using the core cast of characters as inspiration. This Gypsy Productions Murder Mystery Parody features characters such as Jed Clumpett, Daisy May Mostes, and Jane Hatchaway. Dell Comics adapted the series into a comic book series in 1962. The art work was provided by Henry Scarpelli. In 1993, a movie version of The Beverly Hillbillies was released starring Jim Varney as Jed Clampett and featuring Buddy Ebsen in a cameo as Barnaby Jones, the lead character in his long-running post-Hillbillies television series. Based on The Beverly Hillbillies movie, a PC computer adventure game for operating system MS-DOS was developed by Synergistic Software, Inc. and published in 1993 by Capstone Software. ^ Nielsen Media Research (August 6, 2000). "Top 100 TV Shows of All Time". Variety (magazine). Archived from the original on March 15, 2009. Retrieved July 26, 2018. ^ "Hollywood To Make Movie Of Old 'Beverly Hillbillies'". Orlando Sentinel. Retrieved October 6, 2010. ^ Brooks, Tim; Marsh, Earle (2007). The Complete Directory to Prime Time Network and Cable TV Shows 1946-Present (Ninth Edition). Ballantine Books. p. 1683-1685. ISBN 978-0-345-49773-4. ^ "What Does Pa Say 'Bout 'Hillbillies'? : Movies: Buddy Ebsen has warm words for Jim Varney's rendition of the Clampett patriarch and for Penelope Spheeris' take on the old series". latimes. Retrieved April 20, 2015. ^ Note: the Baptist church, which has a strong following in Appalachia and the South, holds immersion (dunking) as the preferred method of baptism. Aspersion (sprinkling) is associated with Roman Catholicism, which practices the rite only for renewing baptismal vows, and thus by emphasizing the difference, Granny emphasizes she is not a Catholic. ^ "Grandma Moses | American artist". Encyclopedia Britannica. 2018. Retrieved February 1, 2018. ^ Lamphier, Peg A.; Welch, Rosanne (2017). Women in American History: A Social, Political, and Cultural Encyclopedia and Document Collection [4 volumes]. ABC-CLIO. p. 48. ISBN 9781610696036. ^ "Max Baer Jr. On Donna Douglas: 'She Was Elly May Until The Day She Died' - RumorFix". RumorFix. Retrieved April 20, 2015. ^ Jim. "The 100 Greatest TV episodes of all time". Archived from the original on October 28, 2007. Retrieved April 20, 2015. ^ "Ralph Foster Museum – Beverly Hillbillies Car, Point Lookout, Missouri". Roadsideamerica.com. Retrieved March 16, 2010. ^ Lewis, Matt (April 7, 2011). "Why Fox News let Glenn Beck go". The Guardian. London. Retrieved April 8, 2011. ^ Quotation taken from amazon.com preview of book, accessed March 23, 2009. Harkins, Anthony (2005). Hillbilly: A Cultural History of an American Icon. Oxford University Press US. p. 203. ISBN 0-19-518950-7. ^ 20 maart 2008. "Paul Henning – Archive Interview Part 8 of 8". YouTube. Archived from the original on August 24, 2012. Retrieved March 16, 2010. ^ "WGN America Fall 2011 Schedule; MeTV Network Celebrates Lucille Ball's 100th Birthday With 100 Episodes of Lucy Series - SitcomsOnline.com News Blog". Retrieved April 20, 2015. ^ "The Beverly Hillbillies DVD news: Announcement for The Beverly Hillbillies – The Official 3rd Season". TVShowsOnDVD.com. Archived from the original on March 30, 2010. Retrieved March 16, 2010. ^ "The Beverly Hillbillies DVD news: Release Date for The Beverly Hillbillies - The Official 4th Season - TVShowsOnDVD.com". Archived from the original on September 26, 2015. Retrieved April 20, 2015. ^ "The Beverly Hillbillies DVD news: Announcement for The Beverly Hillbillies - The Official 4th Season - TVShowsOnDVD.com". Archived from the original on September 26, 2015. Retrieved April 20, 2015. ^ The Beverly Hillbillies. Retrieved April 20, 2015. ^ "Henry Scarpelli (1930 - 4 April 2010, USA)". Lambiek Comiclopedia. Retrieved July 6, 2017. Wikimedia Commons has media related to The Beverly Hillbillies.